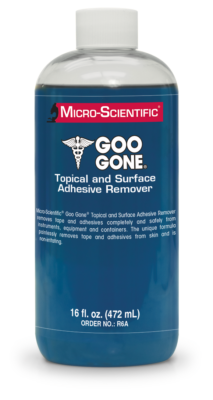 Micro-Scientific® Goo Gone® Topical and Surface Adhesive Remover removes tape and adhesives completely and safely from instruments, equipment and containers. Removes tape and adhesives quickly and effortlessly. Product is safe and compatible with all metals. Directions for use: Saturate cotton swab or gauze with Micro-Scientific® Goo Gone® Topical and Surface Adhesive Remover and apply it to the edge of the tape or adhesive. Pull the tape gently and keep applying Adhesive Remover. Use more Adhesive Remover if tape is being removed from hirsute areas. After using Adhesive Remover on instruments, equipment or containers, follow complete processing procedures again before proceeding with disinfection or sterilization.